Concrete Finishing Tutorial - Quasius Equipment Rentals, Inc. The following info is designed to help the novice better understand the various procedures in pouring and finishing concrete slabs. If you need any further information we are always available to help you with suggestions to help you with your project. Just give us a call and we'll be happy to answer any questions you may have. If you have entered this page from our website's rental listing just hit the Back button on your browser to return to your previous page. When concrete is laid it's wet and heavy. This means it'll slide all over the place unless it is poured into a mold. Concrete forms generally consist of framing lumber set up around the perimeter of the slab and held in place by stakes. 2 x 4s can be used for a 4" slab or 2 x 6s may be used for a deeper slab. If you are pouring a garage slab and you need to pour an 8" grade beam around the perimeter you will probably double up on 2 x 4s to achieve a 7" height. These forms need to be held in place so they don't move. Either wood or steel stakes are used to stake these forms. Steel stakes have an advantage in that they are easier to drive into the ground, they don't split, and they don't shift positions if they hit a stone while driving them in. In addition to stakes you will need kickers if the span is fairly long. Kickers are 1 x 4 boards that lay down as diagonal braces to keep the forms from bowing out with the weight of the wet cement. They are anchored at the one end with a stake and are wedged against the top of the form at the other end. If you are pouring a new slab that butts up against an existing slab be sure to insert of piece of expansion joint or tar strip at that spot to allow for expansion. You will also need some method of laying out the forms. To establish a true 90 degree corner the easiest is to use the Pythagorean Theorem, which in a nutshell boils down to the fact that if you take one side at 3' and the other side at 4', the diagonal between them (the hypotenuse) is going to be 5' long if it's a true right angle. Of course most slabs are larger so you get better accuracy by increasing these measurements equally. Instead of 3, 4, & 5 use 9, 12, and 15 or what ever other multiples work for you. It might also be nice if the slab was level, or at least evenly pitched. It's easier to build things on a flat slab than a roller coaster surface. You can do this somewhat with line levels but the larger the slab, the more room for error. You have to grade out the sand in the middle anyway, so you may want to consider a laser level to do both of these tasks. Step 2 - Is The Soil Ready? Once the forms are in place and set nice and level you need to fill the interior with sand. Clay or black topsoil just doesn't sit still and will settle out after a while and your slab won't be supported and it'll crack. It's best to dig down lower, like maybe 8" for a 4" slab, then fill in the top layer with nice compactable sand. We won't go into the specifics of soil compaction right here but if you click on our Soil Compaction Tutorial link you can find out more about that on that page. Using a laser level lets one person walk around the slab area and check to see how low the sand is and add more as desired. This is the fastest and easiest way to do this. In the absence of a laser level or transit you will need to make a long board to span the width of the slab. The board must be rigid enough to not sag in the middle. Then nail on some 1 x 4 boards to extend down a distance equal to the thickness of your slab. As you drag this board you see it dig in at the high spots and you'll see light underneath the boards where the sand is too low. Once it's in place, compact the soil properly to keep it from settling later on. Concrete slabs shrink and expand with temperature. They also lift and settle with frost conditions. In order to keep this stuff tied together reinforcing is desired. Wire mesh is typically laid on the top of the soil to accomplish this. When you pour the concrete mix be sure to use a hook of some sort to lift this mesh up into the mix. It doesn't do any good laying at the bottom, underneath the concrete. It needs to be imbedded in the concrete. If you use a Kumalong (a solid rake with a hook on the top) to place your concrete they generally have a mesh hook on them for this reason. Once you have the soil and forms ready it's time to get some concrete. For small jobs you can rent a concrete mixer but for larger jobs you'll want ready mix delivered to your site. 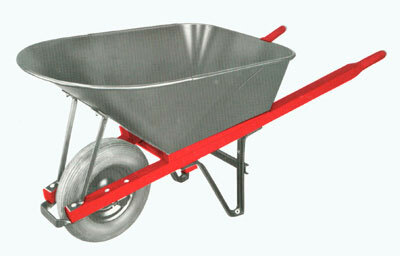 A contractor's wheelbarrow is rated at 6 cubic feet heaped but you'll find that they hold about 4-1/2 to 5 cubic feet of wet cement at a time. That means you'll use 6 wheelbarrow loads to haul one cubic yard of concrete. When you estimate the amount of concrete you'll need take the length x width in feet to get to the square footage. Then multiply this by the depth in feet to get to your cubic footage. A 4" slab is 1/3 of a foot, a 6" slab is 1/2 of a foot, etc. If you are ordering ready mix the guy who takes your order can figure it out for you. Allow for any extras and be realistic when guessing at your depth. If you have a few low spots out there it's going to take more. You don't need to run short when pouring and it's always better to have little extra to waste than to run out. Most pros order an extra 1/4 yard just to be sure. When the concrete comes you need to either spout it right from the truck if possible or to wheel it with wheelbarrows. Don't let the truck run over any forms or go onto your freshly prepared soil. They are extremely heavy and will mess up your soil and forms. Most driver's won't drive up an existing driveway either because the truck can crack 4" slabs. When using wheelbarrows be sure to build a little bridge with scrap lumber so to keep from bouncing on your nice level forms and settling them. Then lay your cement at the far end and work towards the near end. When you have a fair amount in you need to strike it off. This is generally done with a very straight board. 2 x 4s can be used for short spans but you'll want to go larger if it's a longer span or else the board will sag in the middle and your slab won't be flat. We also have a 12' long magnesium strike off board that is very lightweight and perfectly straight. If the span is too wide you may have to do it in stages or else lay a pipe on stakes and work it from there, sliding the pipe back as you move on down the slab. Work the strike off board back and forth as you drag it to help puddle the mix and fill in any low spots as you go. For even better strike off control a power screed can handle the job and also help to settle the concrete and push the stones down from the surface. Bullfloats are an important tool in finishing concrete. They're not a fix all tool designed to do everything but they are important. Bullfloats can be used to correct minor defects in leveling. If you have a divit you can throw a small pile of wet cement there and use the bullfloat to work it in and help level the hole out. The main purpose of the bullfloat is to push the stones down into the mix so that the cream can rise to the top. This will make it much easier to trowel later on. Hand mag floats are used for the same purpose but are used to float out smaller areas. When bullfloating also take an edger to run around the edges of the slab. This will help push the stones away from the corner of the slab so that a smooth edge that is more resistant to chipping can be obtained. You'll probably have to edge it quite frequently throughout the pour because floating and troweling tends to fill up the nice edge you just made. Step 6 - Troweling or Brooming? Once you have the slab all laid out nice and level, bullfloated, and edged you're still not done. If you leave it as is it'll get slippery when wet and form a safety hazard. If you attach a finishing broom to the bullfloat handles you can run this broom across the slab (after waiting a while) to rough up the finish just enough so that you will have traction on it when it gets wet. But floating only brings the cream to the surface. The cream is not firmly packed and will eventually pit and show pock marks later on. Road salt dripping onto the slab from vehicles during winter will greatly accelerate this damage. Troweling is the operation of pressing this loose cream into a hard durable finish. Floating is accomplished by running a flat magnesium float over the surface to push down the stones while the mix is still wet. Troweling utilizes a steel trowel blade that flexes to help push down on that cream later on when much of the moisture has evaporated and the mix is more firm. By pressing a trowel blade across the surface the loose cream is compacted into a hard shell finish that will resist the elements much better than a bullfloated and broomed finish. Of course, once the finish is troweled you will still need to broom it or else you'll have an ice rink the first time it gets wet. 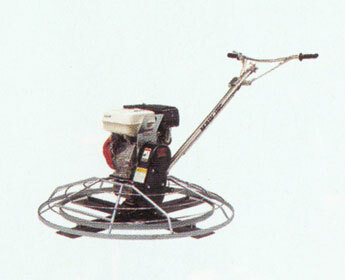 Both troweling and floating can be done either by hand or with a power trowel. 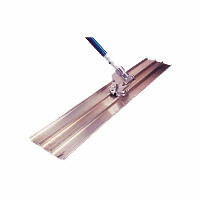 A power trowel consists of both finish blades and float blades and can cover a great deal of area in a hurry. On a larger slab it may be impossible to trowel it by hand unless you have a large crew of guys. The power trowel has the advantage of waiting until the right moment and going out there and getting it done when the time is right before the slab gets away from you. 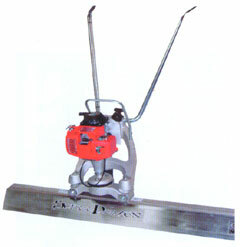 For more info please click on our Power Trowel link. After the slab is set up you need to protect it. Concrete takes 28 days to cure at 60 degrees and average humidity. Concrete does not cure by drying out. In fact, that's the worst thing that can happen. Some of the strongest concrete around is poured underwater for bridge columns. Concrete cures as a chemical process. Once the slab is set up keep it from drying out by watering it that evening. The water won't "melt" the concrete if it is truly set up adequately. After about 1 day it should be good enough to walk on and after 1 week it should be safe to drive on with an automobile, longer if heavier trucks. Also, if you are pouring in the off season protect it from freezing for the first 2 weeks. As mentioned earlier, concrete will expand and contract with temperature changes. This means it will crack. You can't help it - it's an eventuality and you can't stop it. But you can control where it cracks. By sawing your slab into sizeable increments you will weaken the slab at those areas. Then, when it is stressed, it will crack right underneath the areas you sawed. You normally saw no more than 1/4 of the slab thickness for a control joint. When the crack occurs it will be a rough break right underneath the saw cut. By not sawing all the way through you also ensure the slab floats evenly and that you don't have individual blocks that have heaved up. Sawing can be done at any time but it's a good idea to wait at least 2 days before sawing. If you don't you run the risk of cratering along the saw joint because the stones aren't held firmly in place and will blow out of the cut when the blade hits them. While this tutorial is not exactly a complete "everything you wanted to know about concrete" course, we hope it will help you to better understand what you are going to encounter along the way. For further help, contact your ready mix supplier or other professionals. As always, feel free to contact us with your exact situation and we'll be happy to help in any way we can.